Edited by the National Book Award-winning poet Terrance Hayes, the foremost annual anthology of contemporary American poetry returns: “A ‘best’ anthology that really lives up to its title” (Chicago Tribune). The first book of poetry that Terrance Hayes ever bought was the 1990 edition of The Best American Poetry, edited by Jorie Graham. Hayes was then an undergrad at a small South Carolina college. He has since published four highly honored books of poetry, is a professor of poetry at the University of Pittsburgh, has appeared multiple times in the series, and is one of today’s most decorated poets. His brazen, restless poems capture the diversity of American culture with singular artistry, grappling with facile assumptions about identity and the complex repercussions of race history in this country. 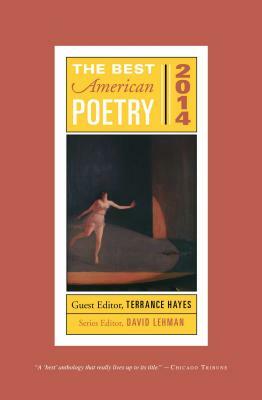 Always eagerly anticipated, the 2014 volume of The Best American Poetry begins with David Lehman’s “state-of-the-art” foreword followed by an inspired introduction from Terrance Hayes on his picks for the best American poems of the past year. Following the poems is the apparatus for which the series has won acclaim: notes from the poets about the writing of their poems. Terrance Hayes is the author of four collections including Lighthead, winner of the 2010 National Book Award in Poetry; Hip Logic, which won the National Poetry Series; and Muscular Music, winner of the Kate Tufts Discovery Award. He is a professor of creative writing at The University of Pittsburgh and lives in Pittsburgh, Pennsylvania, with his wife, the poet Yona Harvey, and their family.